17 yr old TRANE may be de-railing! I have a Trane Gas/Electric package YCC030F1M0BC downstairs (about 1400 sq ft) and a Trane Heat pumps XL 1200 TWX024C100A1 for the upstairs (about another 1400 sq ft-open ceiling). The Air-handler model is TWE031E130A0. 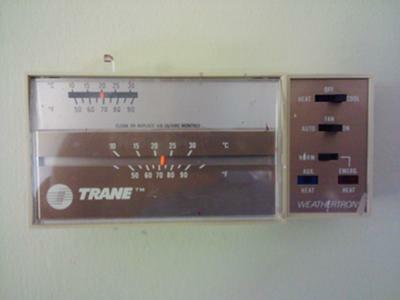 Last summer the central air conditioner struggled to keep the temp below 71 degrees. This spring the downstairs is cooling ok, but the upstairs is rather warm, especially in the afternoons and early evening. I leave the upstairs thermostat fan on the ON position at all times to keep the air moving. A neighbor told us the Condenser outside made an awful sound a couple of times. I heard it only once...a loud bearing going bad sound. Currently the fans are running, but downstairs the gas pack unit is blowing out warmer air than the upstairs. I do not see any drainage upstairs and have new filters in. There is no visual evidence of anything being real dirty or any lines freezing. Recently we have switched heat to cool upstairs pretty often. Now we are keeping it on cool at all times. About 6pm last night the upstairs registered 77 or 78, but I have it set on 68. With it being older, I want to get as much use out of the heating unit as possible before upgrading or doing a expensive repair. Any advise out there that can help me put the TRANE back on the tracks until this economy can turn around? Comments for 17 yr old TRANE may be de-railing! 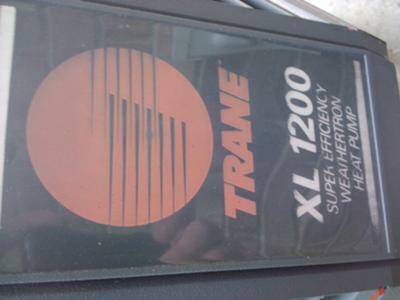 I also have a Trane XL1200 that had worked until a month ago. Air seemed a little warmer than it should have been so I switched system off in case evaporator was iced up. Attempted to restart the next morning and all I get is the breaker knocking. Is the compressor locked up or do I have an issue with something else-start up capacitor, etc? Also, what is the difference in the compressors that have a GA or JA as last 2 digits? Got a new Trane air handler and ac unit for the house(2750 sq ft)on May 2010 about $6000. Workered great unitl August 2 2011. Now it is broke no motors in town had to wait 3 day in the florida heat for motor to arrive was charged $300. for installation. I would look else where. The company that put it in said it is common for Trane motors to burn out so quick. Most likely I will be making a service call. I thought I would try and get some feedback prior so I might have an idea of what's wrong. I cut the central air conditioning unit off for a couple of minutes and cut it back on and it sounded fine. Although, the air that is coming out of the vents is not very cold. It may be a degree or two colder than what is in the room. Downstairs the air blown out is several degrees cooler but not much. Anyway thanks to everyone in advance for your feedback! 17 years old Heat Pump unit is not that old. There are so many reasons why Heat Pump is not cooling purposely. The best advise I could offer you is to hire professional technician to look at it. He/she will understand the problem once he/she sees it. Join in and write your own page! It's easy to do. How? Simply click here to return to Trane Central Air Conditioners Reviews.